I have a dish that will be a great addition to your 4th of July BBQ...or if you are just craving some comfort food. I went to a BBQ at my coworkers a couple of weekends ago and I got the request for some more spicy mac and cheese. I wanted to go with something a little more mild than the Habanero Mac & Cheese, but still had a kick and got inspired by this Serrano Creamed Spinach. That way Mr. KMW could eat it this time around! Have I mentioned that I can't get enough Mac & Cheese in my life? Because I can't, love that stuff. This version included Aged Gouda and my latest go to cheese, Beecher's Flagship. This was a great side with all of the amazing smoked wings and ribs we had, my coworker is from Texas so she knows how to do her BBQ! One additional note, I wanted to make some homemade breadcrumbs for this and toast them in butter, but time ran out so I went with Panko which always gives a nice crunch. I definitely encourage you to make your own if you have the time! In a large high sided skillet melt butter over medium heat. Once melted add shallots and cook for about 4 to 5 minutes. Add garlic and cook for about half a minute more. Whisk in flour. Then slowly whisk in milk. Whisk continuously until milk begins to bubble and starts to thicken, about 5 minutes. Remove from heat and stir in 1-1/2 cups of gouda and 1 cups of Beechers Flagship Cheese. Stir in cayenne. Bring water in pot to boil and cook macaroni about 2 minutes under package directions. While pasta is cooking, heat oil over medium high heat in a smaller stove top pan. Add spinach (can do it in batches until it cooks down if pan isn't large enough), season with salt and pepper and continue cooking, stirring around occasionally until spinach cooks down. 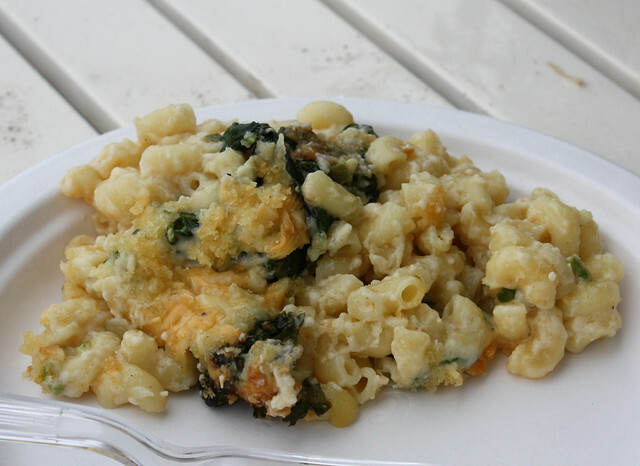 Stir cooked macaroni into milk and cheese mixture and pour into a 9 x 13 baking dish. 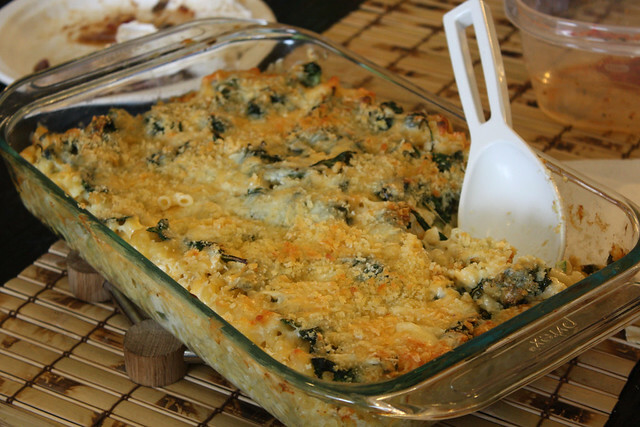 Top evenly with cooked spinach and then sprinkle on remaining cheese. Add panko breadcrumbs to top and spray with cooking spray (to help brown). Cook for 30 to 35 minutes or until breadcrumbs start to brown. This sounds like the perfect comfort food!! Love the different cheeses and spinach! Thank you for the comment, but, your comment will not appear publicly until it has been approved by Carrie since you chose to post anonymously.